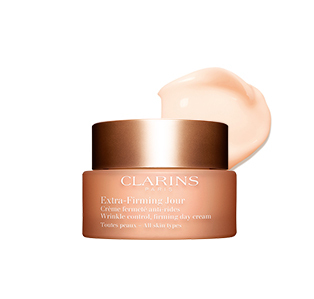 Dry, oily, shiny or lacking firmness? There’s a mask for that! Dry SkinHow to recognize it? 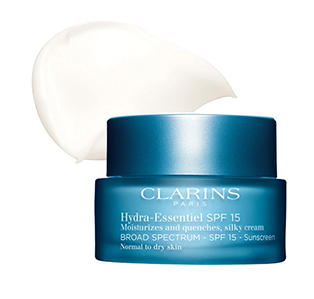 Unlike dehydration, which is temporary, dryness is a permanent condition that can make skin feel sensitive. Flaky and rough to the touch—skin is tight, uncomfortable and lacks suppleness. Combination SkinHow to recognize it? Skin looks shiny in some places, and often has enlarged pores in the T-zone: forehead, nose and chin. The rest of the face can be normal or dry. Oily SkinHow to recognize it? Skin looks shiny all over, with an uneven texture and enlarged pores—particularly in the T-zone: forehead, nose and chin. 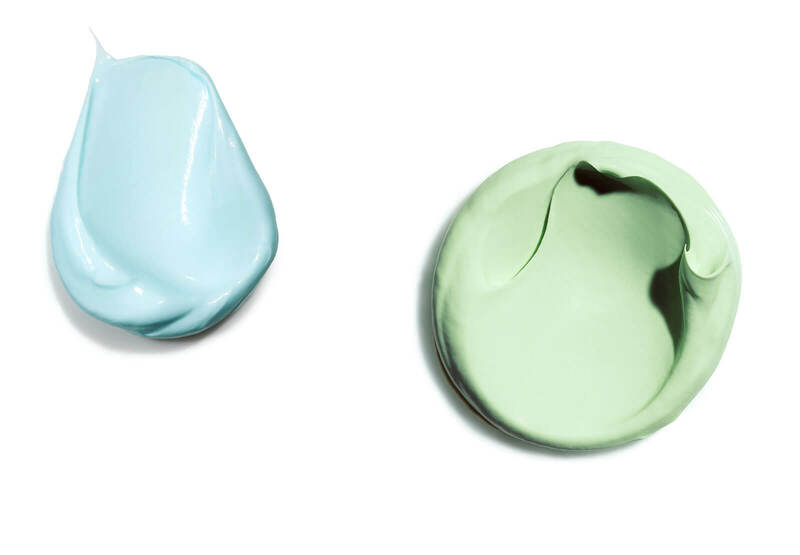 Too much oil makes skin prone to breakouts and dullness. What is your main beauty concern? 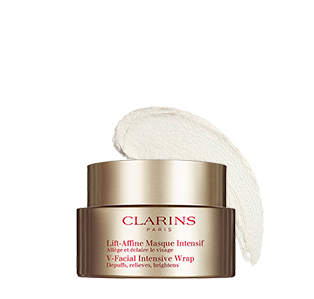 The 10-minute solution to morning puffiness and swelling caused by stress, heat and hormonal changes. 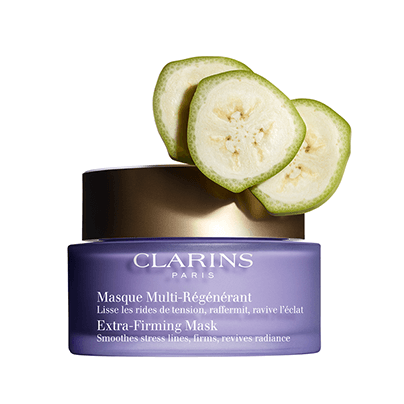 This luxurious cream-mousse mask relieves puffiness to visibly refine facial features with Beautyberry and Ginger extracts, and Escin from Horse Chestnut. Brightens skin tone to defy dullness with Lady’s Mantle extract. 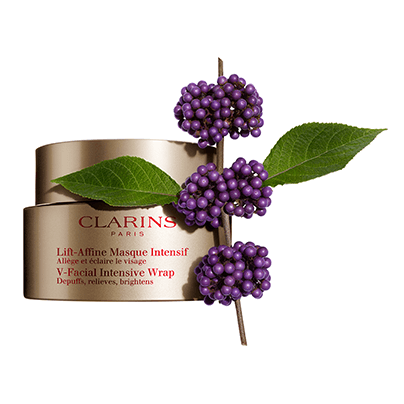 To take down swelling and puffiness even faster, store V-Facial Intensive Wrap in the fridge and rinse with cool water. 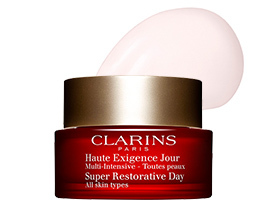 The Clarins Experts answer your questions. 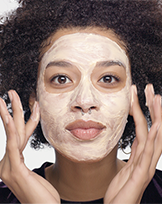 Why use a scrub before applying my mask? Gently polishing away impurities and dead cells that collect on the skin’s surface frees pores to accept the full benefits of the treatments to follow. When do I apply my mask? 1-2 times per week, as needed. 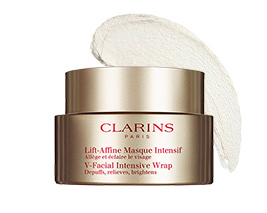 What ingredients are in V-Facial Intensive Wrap? I have problems with water retention and my skin is dry. Which mask is right for me? Alternate between using V-Facial Intensive Wrap one night a week, and SOS Comfort the other night. This age-defying sheet mask—with replenishing Harungana extract—visibly lifts, plumps and minimizes the appearance of lines and wrinkles. 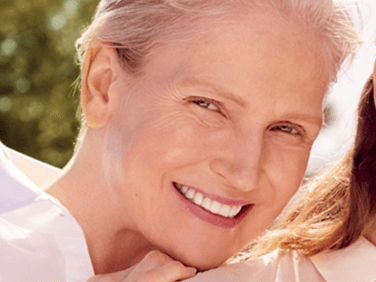 The synergy between the powerful anti-aging serum and the stretchy, face-hugging sheet, promotes optimal ingredient delivery for radiant, younger-looking skin in 15 minutes! 1. 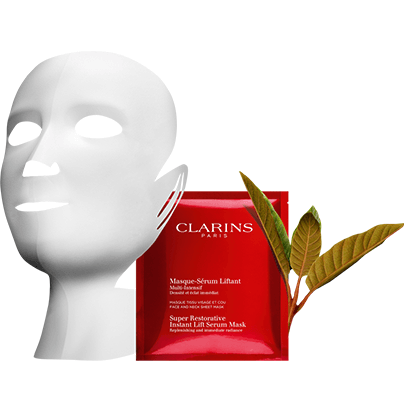 Remove mask from packet and gently unfold. 2. Place on clean face and neck, positioning over forehead first, then around eyes. 3. Unfold side tabs and place slits over ears to hold mask in place. Make sure openings over mouth and nose are positioned correctly. 4. Stretch the tabs and attach behind the neck. 5. 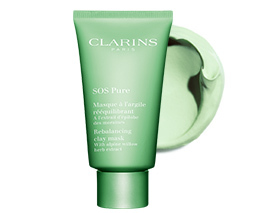 Gently press hands over mask to make sure it is pressed snugly over the skin. 6. Leave on for 15 minutes. 7. 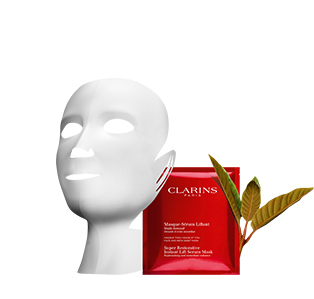 Remove mask and gently smooth remaining serum onto the skin. Apply once or twice a week, as needed. Mask is for single use only. 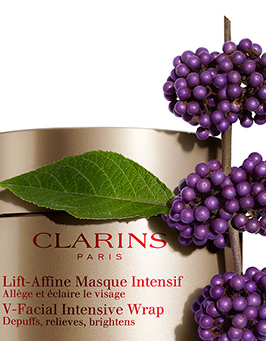 What ingredients are in Super Restorative Instant Lift Serum Mask? My skin is dry and lacking density. Which mask is right for me? Alternate between using Super Restorative Instant Lift Serum Mask one night a week, and SOS Comfort the other night. A mini-spa for your skin! 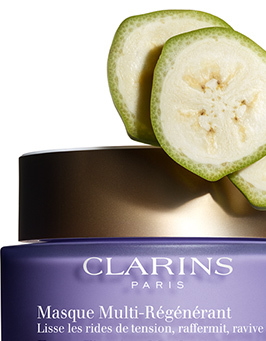 The 1st relaxing anti-aging mask* contains Organic Green Banana and Lemon Thyme to help visibly smooth stress lines and wrinkles, restore firmness and revive radiance—for younger-looking skin in just 10 minutes! 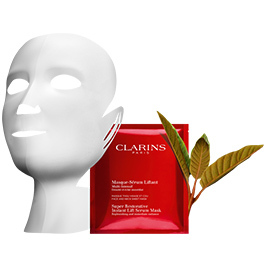 Before applying, inhale the relaxing, aromatic essences of Extra-Firming Mask’s pure plant extracts. 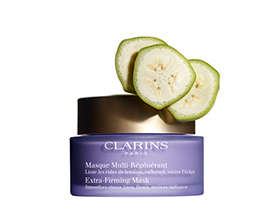 What ingredients are in Extra-Firming Mask? My skin needs both firming and hydration. Which mask is right for me? 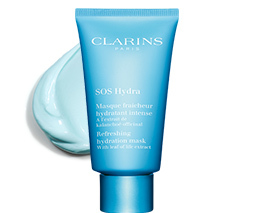 Alternate between using Extra-Firming Facial Mask one night a week, and SOS Hydra Mask the other night. 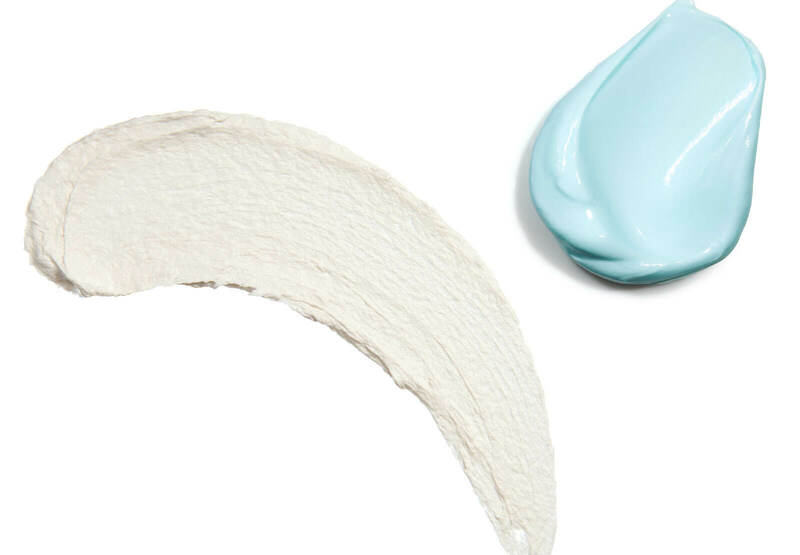 The 10-minute beauty reset for skin that’s rough, dull, flaky and dry—this nourishing face mask is enriched with wild Mango Butter to soften, comfort and renew radiance. 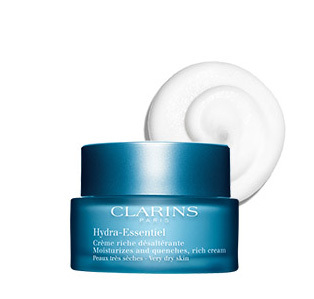 Creamy formula delivers moments of pure relaxation for skin and senses. 1. Apply to face and neck, avoiding eye area. 2. Leave on for 10 minutes. 3. 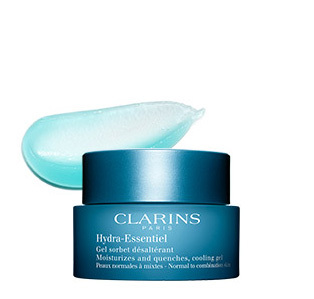 Gently smooth excess product onto skin, or remove with a cotton pad soaked in Toning Lotion. Smooth over face and neck. 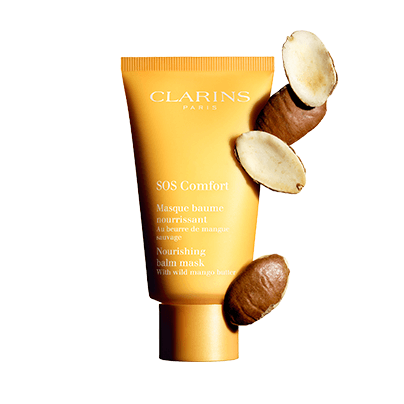 To allow your skin to optimally absorb your SOS Comfort Mask, apply strong pressure with your hands. Super-dry skin? 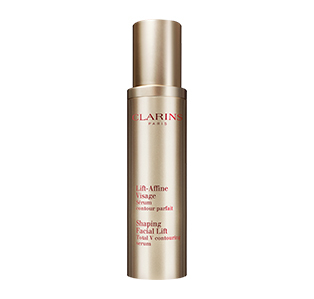 Leave it on all night long for soft, smooth, radiant skin by morning. Exfoliation removes dead cells that collect on the skin’s surface and make it look dull, flaky and rough. 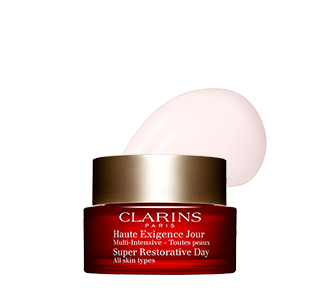 It also frees pores up to receive the full benefits of the treatments to follow. 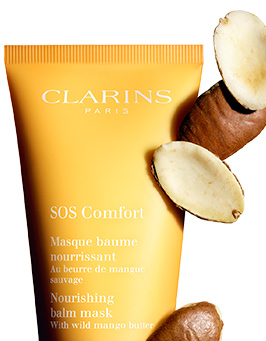 What ingredients are in SOS Comfort Nourishing Balm Mask? My skin is dry except for an oily T-zone. Which mask is right for me? 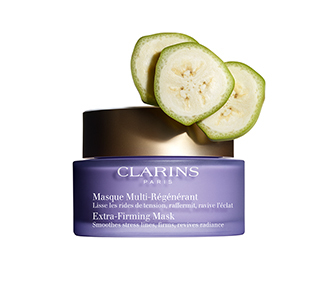 Try multi-masking. Apply SOS Pure to your T-zone, and SOS Comfort to the rest of your face and neck. 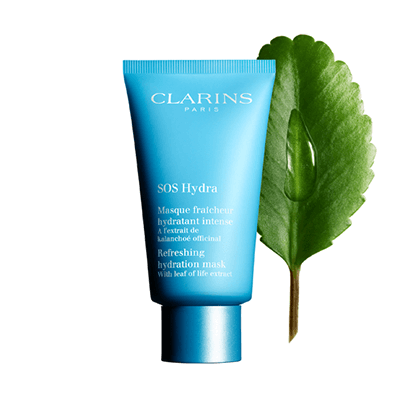 The 10-minute moisture fix for skin that is dull, tight and thirsty—this hydrating face mask contains super-quenching Organic Leaf of Life extract to visibly smooth fine lines, soothe irritations and revive radiance. 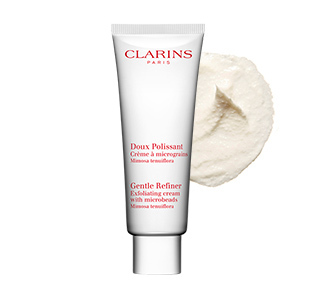 Refreshing cream-gel formula enhances skin with a healthy-looking glow. 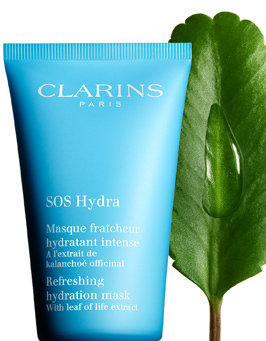 For an extra-refreshing effect, keep your SOS Hydra Mask in the refrigerator. 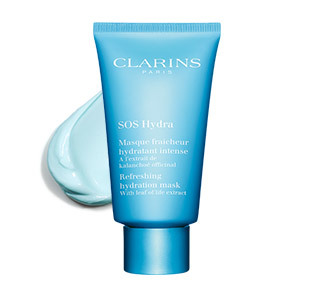 What ingredients are in SOS Hydra Refreshing Hydration Mask? My skin is dehydrated except for an oily T-zone. Which mask is right for me? Try multi-masking. Apply SOS Pure to your T-zone, and SOS Hydra to the rest of your face and neck. 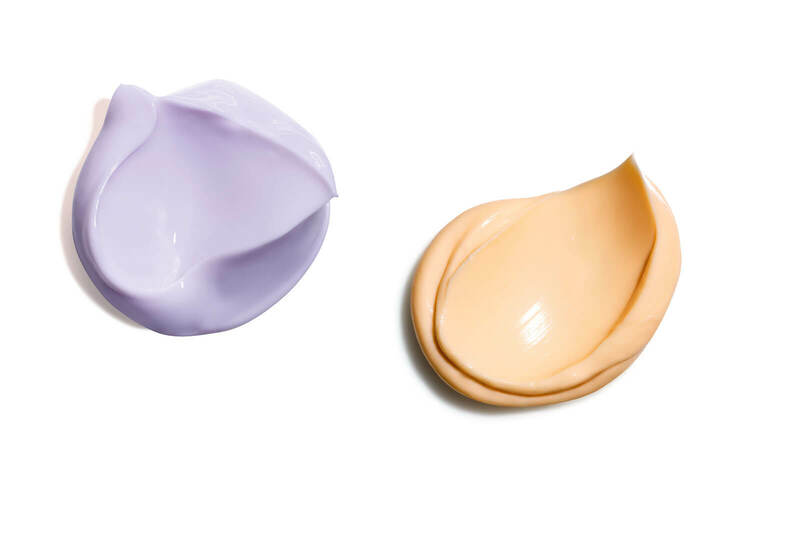 The 10-minute radiance reboot for skin that tends to be oily—this purifying Clay face mask contains Alpine Willow Herb to help remove impurities, downsize pores and defy shine. 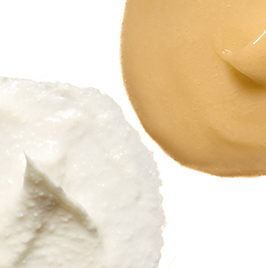 Powdery cream-paste texture leaves skin clean, refreshed and glowing—never dry. 3. 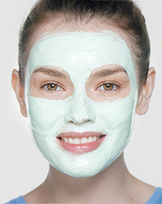 Rinse face with cool water to refine pores. 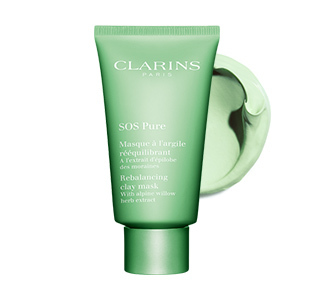 Rinse off your SOS Pure Mask with cool water to maximize its astringent effect. 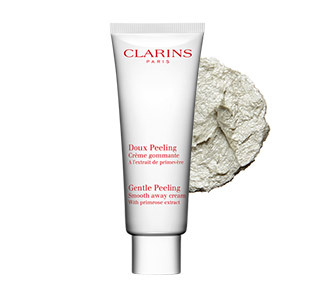 Exfoliation removes pore-clogging excess sebum, dead cells and debris that can lead to blemishes and oil slicks. 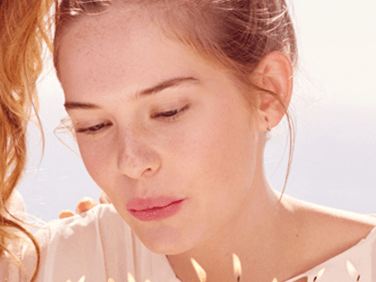 It also frees pores up to receive the full benefits of the treatments to follow. 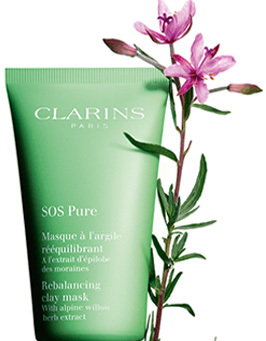 What ingredients are in SOS Pure Rebalancing Clay Mask?